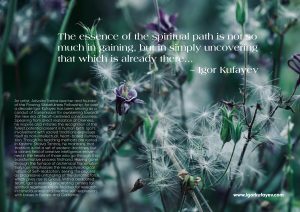 As this amazing and transformative year comes to an end, we reflect upon all the ways in which each of us took part in and was blessed with the Grace flowing from Igor’s offerings and work, and the deepening and progression of our unique spiritual journeys. 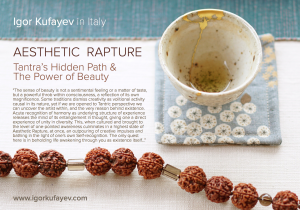 This year, Igor held two week-long immersions in Italy and California, one weekend workshop in California, and one 3-day immersion in Freiburg, Germany; each of these programs birthed its own breakthroughs and unforgettable, heartfelt connections to one’s own Self, as well as to other companions on this path. It is a great gift and privilege to be able to witness the sheer beauty, magic and healing power of this work during the immersions, guiding us to continuously free our nervous system from self-imposed impositions so that the silent music of the Self can play its tunes through us. Since early October, Igor and his family have been on the road for the US teaching tour – this year marks his fifth consecutive return to California – where he has been coming not to provide spiritual entertainment but to gather those who are serious about investigating the depths of their own Consciousness and are ready to take that uncompromising turn of reclaiming one’s Divine Self. It’s been a journey that has had its fair share of both challenges and discoveries; yet with every return, the novelty of bringing this work to those who experience deep resonance always remains. These live events with Igor organically lend themselves to the creation of sangha, a community of those who have been initiated into the path of neuro-physiological transformation by Igor, and who gather in the name of knowing one’s Self with dedication and sincerity. We’ve excitedly seen this year the expansion of the work in Germany and Belgium, where gatherings are held on a regular basis – and as our community continues to grow across two continents! These sangha gatherings are literally the containers in which this work is held, through the blessing of the Teacher, and within the hearts of committed students. In the spirit of this shared enthusiasm, we wish to express our heartfelt gratitude to all who support the growth of this work; who acknowledge it from near or far, in visible or invisible ways; who offer their attention, dedication and love in the form of selfless service; and who reach out with sweet letters, lively comments on our Social media platforms, feedback or silent appreciation. Several programs with Igor are already planned for the year to come, both in Europe and North America, and we anticipate for Igor’s teaching and work to touch the hearts of those who feel compelled to sit in the presence of an adept and take their spiritual unfoldment to deeper layers. We look forward to being together again soon, to continue our inner work and share the love.